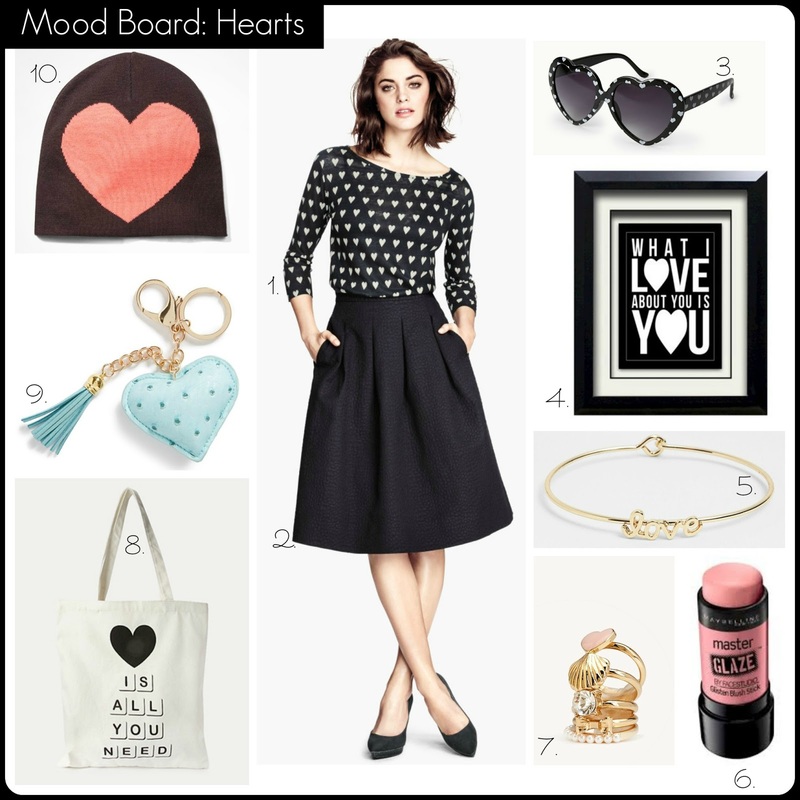 I've been noticing more and more hearts popping up on sweaters, keychains and my favorite, sunnies! It's no surprise that we are having a love invasion since Valentine's Day is just over a month away. I was inspired by this retro chic look on H&M's website while browsing their new arrivals. I thought I'd share 10 things to inspire you to get in the mood. This skirt is my idea of chic - it's a longer skirt with pockets and has that Parisian flair. I have been looking at ways to freshen up my apartment and came across this print online. There is always a steady stream of "Love" bracelets and this one is so sweet. I spotted the new blushes at Target and didn't pick one up..yet. The colors look so pretty and they would be great to carry on the go and less messy than powder blush for touch-ups. This is one of the cutest sets of rings, on my list for the weekend too! I have so many of the F21 totes, but they are hard to pass up for less than four dollars. I just saw this at Nordstrom and will be attaching it to the outside of my purse for decoration. Aww..wear your heart on your head, Lol. H&M Take 25% off 1 item using code 6428 + Free Shipping using code 1341. Thanks to The Fashion Palate for the tip! #1 and #2 paired together....just love that whole outfit!! My birthday is Valentine's Day, so I am love'n this post! Sales to Shop, Shop, Shop! 10 Statement Necklaces for under $15!! Weekend Notebook: Target New Arrivals!! Rihanna x MAC Viva Glam is Here!! H&M - Extra 50% off Sale prices!! Work Chic under $25 + Sales to Shop now!! Peter Pilotto x Target Lookbook is here!! Splurge v. Steal: Peep-Toe Bootie for only $35! !